Courtney and I recently had the opportunity to review some awesome WOW Toys! If you are familiar with WOW Toys, then you understand just how great this was and if you aren't, then get ready to learn about some original, fun, high quality toys! WOW Toys are known as toys that don't break their promises! WOW Toys do not require batteries just a child's imagination, but they have lots of cool effects and sounds that run via kid power. I was sent the Penny's Pooch 'n' Ride to review with Sweet Pea. I like the age range that this toy covers and the different child development skills it covers as well. I love having toys in my house that help promote development skills. 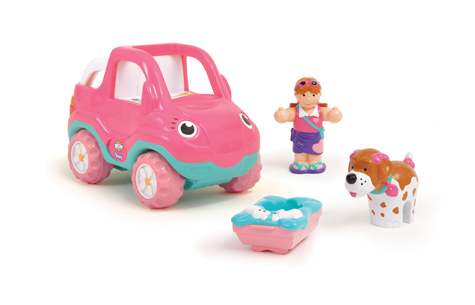 I like that this toy is motorised, has realistic engine sounds, the memovable dog basket with fixed puppies detail, it has mix and match trailer hook and moving wheels for easy push-along play. Sweet Pea loves puting the girl in the truck and pushing it around the living room. Her brothers will build houses with their blocks so she has a small town for her truck and puppy to drive through. These toys are a big hit in my family and I am happy to have them in my home. I would defiently recommend to other parents who are looking for toys that do not require batteries but are still a ton of fun! How would you like to own a Peeny's Pooch 'n' Ride for a little girl in your life or a Ernie Fire Engine for the little boy in your life? Then simply enter the Rafflecopter form below. This giveaway is Open Worldwide to anyone aged 18+. I also like Mario's Pizzeria. I love the Pippa’s Princess Carriage! I like the Farm Friends Set.